Gear4's HouseParty Rise dock has smart control | What Hi-Fi? Gear4's HouseParty Rise alarm dock radio has SmartLink control so you can adjust the volume, change radio stations and select music tracks using a free iPhone/iPod app. 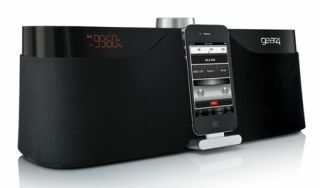 You can even control a docked iOS device with a second iPhone or iPod Touch using the wireless remote control feature. Nifty. Pre-set alarms on an iPhone/iPod Touch automatically sync with the HouseParty once docked, and you can search for your favourite radio stations using the suto-scan feature. If you keep the dock in the bedroom, you can dim the LCD screen at night via your iPhone, and there's a large snooze button if that early morning wakeup call is too troublesome. The Gear4 HouseParty Rise is available now for around £100.